As you know by now, Alexander's Steakhouse is hands down, one of my favorite restaurants in the city. It seems like a bit of an undiscovered gem to me, I really don't understand how they aren't more popular. It is my go-to place for just about every sort of meal, from the special foie gras dinners, to amazing burgers or just appetizers and desserts in the bar, to more classic steak dinners. I've reviewed Alexander's so many times (in particular, I give a good summary of why I love the place here), so I'll skip the usual ramble here and just focus on anything that was particularly different this evening, and on reviewing the individual dishes. Foie Gras Terrine - duck rillette, pickled green strawberries, black garlic sable, rooibos cream, lychee miso, basil. If you can do basic math, then you understand how amazing this deal is! It seemed like a great excuse to go try another wagyu (I'm only recently starting to get into steak as it wasn't something I grew up eating, and I'm finally starting to learn the differences in cuts/breeds/aging, but I've only had a handful of different wagyus so far ... although my Alexander's habits are quickly changing this!). The entire experience was great, as always. The staff recognize us by now and always welcome us openly. Going there honestly sort of feels like walking into a good friend's home. Service was impecable, from absolutely every individual with whom we interacted. Thank you Alexander's for yet another memorable meal, and making us feel special, even though we were using a "deal"! I obviously highly recommend Alexander's in general, but this deal is really phenomenal. You can still cash in on it for a few more days, it is valid until June 5! Purchase here (and tell them Julie sent ya!). 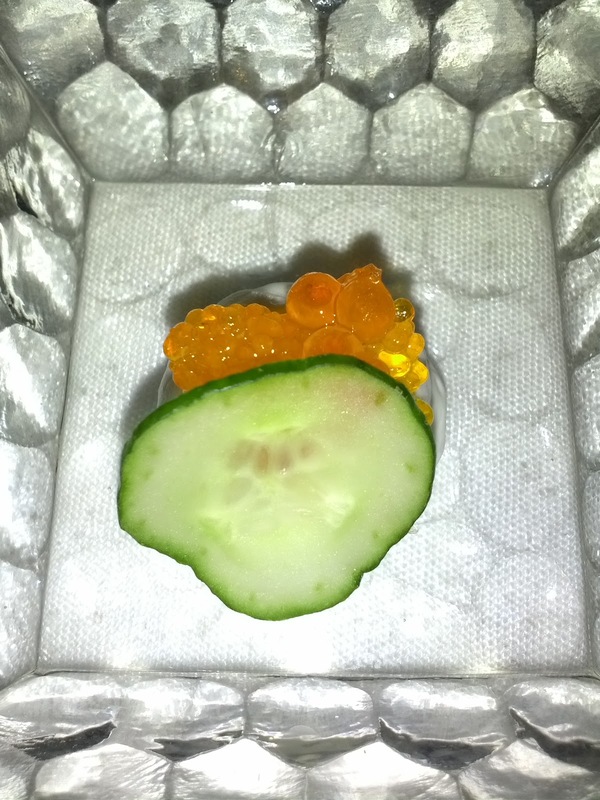 Amuse Bouche: cucumber cream cheese, cucumber slice, trout roe, citrus sriracha pearls. 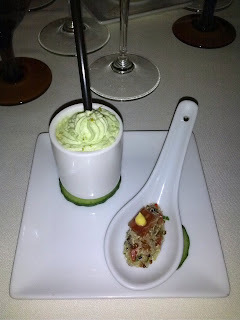 The amuse reminded me of tea party sandwiches, perhaps because that is the only time I've had cucumber and cream cheese together. Anyway, it was cream cheese, topped with a crisp slice of cucumber, and then trout roe and citrus sriracha pearls. I liked the play of pearls mimicking the roe, but I didn't really taste the citrus nor sriracha. The roe added a nice bit of salt and pop. I didn't love this, but it was light and fresh. Bread service included the standard Acme breads (baguette, olive bread, whole wheat walnut bread), along with the more recent addition of the house made bacon roll. I've had all of the breads a zillion times, and didn't want to fill up on them, so I was planning to skip bread service entirely, but ... they had a new one! Crackers! These were really tasty. 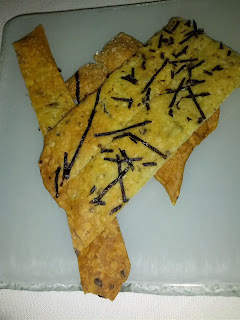 Super crisp, oily in a good way, and topped with nori, furikake, and black sesame. They had a slight spiciness to them. I really liked these, and thought they were far more fun than standard bread and butter. They paired really nicely with red wine too! Hamachi Shot - truffled ponzu sauce, ginger, jalapeno, avocado, lime. The hamachi shot is one of Alexander's signature dishes, at both the Cupertino and San Francisco locations. I think it has been on the menu for ages. I had one the very first time I visited in Cupertino, but haven't had one since, mostly because I'm allergic to avocado so I don't go seeking out dishes containing it, and because there are always a zillion other new dishes I want to try. But tonight, I got to re-visit this classic. Like everyone says, this is a nicely balanced bite. The jalapeno adds a little kick, the ponzu sauce is sweet and delicious, the arare add a crunch, the avocado adds a richness and creaminess, the ginger makes it refreshing, and the hamachi is good quality. Nothing bad to say about this, and I'm glad I got to have it again after so long, but I'll go back to skipping it, as there are too many other interesting sounding raw fish dishes on their current menu. There were four options for the second course. We (shocker!) all picked the foie. I was actually tempted by the scallops with uni, as I love both of those ingredients and know Alexander's does them well, but our foie days are numbered and this was a new preparation that I just had to try :) One other option was the other signature Alexnader's dish on the menu: the caesar salad with sous vide egg. Again, something I had the first or second time I visited, but haven't had again since there are always just too many other better sounding things. I recall it being a pretty fantastic caesar though. I can't imagine who on earth picks the iceberg wedge option! Like all of the non-steak at Alexander's, there was a lot going on here. The terrine was obviously the star of the plate, very creamy and rich. 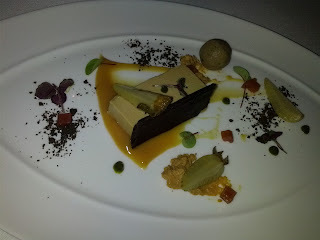 It had an ok foie flavor, but wasn't quite as strong or intense as I'd like. The ball was the duck rillette, which did have a very strong flavor. I didn't care for this much however, it was kinda mushy and stringy. The others at the table really liked it, but I think rilettes just aren't really my thing. Leaning up against the terrine was the black garlic sable. This was very crispy. I didn't taste black garlic and didn't find this all that interesting. Under the strawberry and on the other side of the plate was the rooibos cream. It had such an intense rooibos flavor! And it was very creamy. I liked this component, but not with the foie, nor anything else on the plate really. I thought it was incredibly interesting however, and did scoop it all up, just on its own. The terrine was on top of the lychee miso sauce. Now this was delicious! Sweet from the lychee, salty from the miso, just tasty tasty tasty. And it went great with everything else, both the sweetness and the saltiness pairing perfectly with the foie, and I really liked it with the pickled strawberries too. Also on the plate were some pickled green strawberries. They were super vinegary and tart. I love pickled things so I really enjoyed these, although I didn't quite get the pairing with the rich foie. There was also some micro basil, a black powder that I forget what it was, and tiny cubes of something ... pink. Overall I found this a little disappointing, it just didn't have as strong of a foie flavor as I was really looking for. I did love the creaminess of the terrine and the deliciousness that was lychee miso sauce though! Extra gift from the kitchen: braised pork belly! Until a couple weeks ago, I thought I didn't like pork belly. I've always found it to be too fatty, too gummy, and just kinda gross. I'd never order it in a million years, and always substitute something else when given the chance if it shows up on a tasting menu. But ... a few weeks ago, at Alexander's of course, someone else ordered the pork belly appetizer. It was incredible! It totally and completely changed my opinion of pork belly. When the servers initially brought this over, I had a moment of sadness upon hearing "pork belly". But then I remembered that I'd actually enjoyed it last time, and I dug in. And ... it was delicious! The pork belly itself had an insanely crispy shell but was super tender on the inside. It crunched as you cut into it. It was like bacon, but a thousand times better. The sauce it was braised in was fairly sweet and delicious. Brighting up the plate was a smooth fava bean puree that I didn't notice much, too preoccupied by the flavorful pork belly, but it did add a nice color to the dish. There was also some pickled braised diakon, like the strawberry in the foie dish, this was vinegary and I really liked it. It went nicely with the pork belly. Finally, there was a chunk of glazed white asparagus, nicely cooked, crunchy, and sweet from the glaze. There were of course micro greens as a garnish, along with some ginger that was really refreshing and a rather amazingly strong flavor. This was delicious, and the favorite dish for several at the table. I can safely say that Alexander's has truly changed my opinion on pork belly! Thank you chef for sending out this extra treat! Next up came a little intermezzo to prepare us for our steaks. A creamy, sweet rhubarb sorbet, perched on top of a sour mitsuba leaf. I don't really like rhubarb much, so this was kinda meh to me. Full Blood Wagyu Akaushi Strip Steak - curry horseradish, charred asparagus, porcini mushrooms. As I mentioned earlier, I'm still just really getting into steaks. They just weren't something I ever had growing up, and until recently, I barely knew there was a difference in cuts of steak, let alone in the type of animal they were coming from. I've learned that my cut of choice is the still just a filet. A strip is probably my second choice. And I really don't like ribeye. And few weeks ago I had my first Sher full blood, followed shortly thereafter by the Tajima F1. I've been seriously spoiled, and don't know how to go back to ordering the standard cuts anymore! Anyway, this was a full blood strip steak. I didn't like it nearly as much as the Sher full blood strip, nor as much as the Tajima F1 filet. It was very tender, with good flavor, but just not as amazing as those prior steaks. It had a good salt level on the crust, but it wasn't seared quite as nicely as most of the steaks I have had in the past at Alexander's. I would have liked a better crust on it. The horseradish curry sauce was good, with a strong curry flavor. It complimented the meat well. The porcinis were awesome. One other person at the table took a bite of his and started exclaiming, "that is a really good mushroom!" Just a mushroom, but it had a great hearty flavor, and seemed like it had been cooked in a nice amount of butter. Super tasty. The charred asparagus was kinda just another chunk of asparagus. I'm pretty sick of asparagus these days, which is fine, as asparagus season is just about over. I think I just had too much of it as everywhere has been going asparagus crazy lately. The red orach on top had a nice flavor and crunch. I found this dish a little disappointing. I think I went into it expecting it to be mind blowing like the other wagyus I've had recently, and this was more just a standard, good, steak. I wouldn't order this cut again. 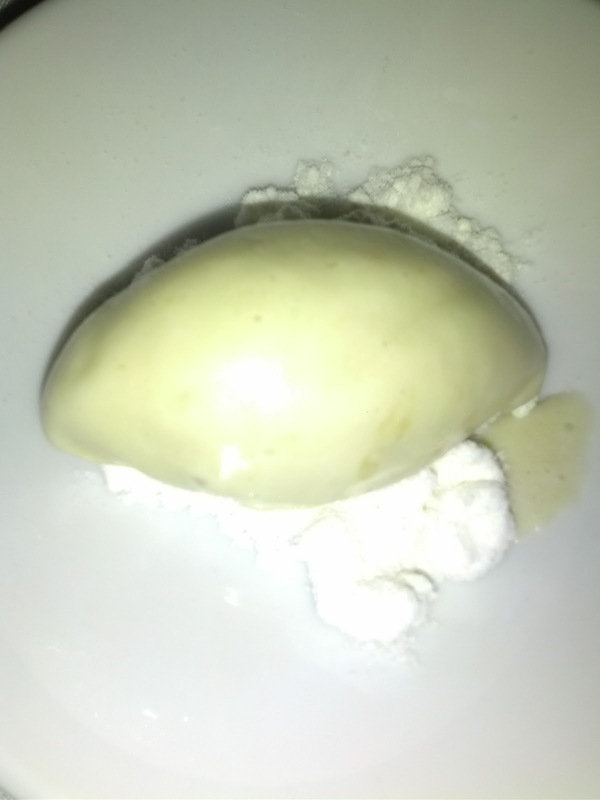 Palette Cleanser: banana ice cream, white chocolate powder. And another little palette cleanser. The ice cream had very strong banana flavor, but wasn't very creamy. The white chocolate powder had a really nice flavor. I found the pairing of ice cream and powder to be fairly interesting. And no meal is complete at Alexander's without some cotton candy! Today's flavor was "leapin' lime", a sweet lime flavor. 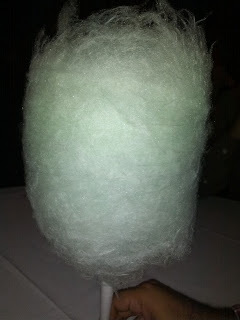 Fluffy, sweet, fairly standard cotton candy. Always fun to eat. 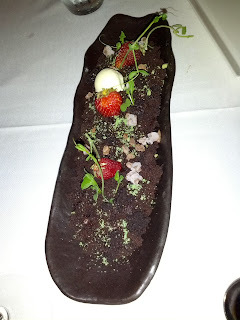 Ichigo Patch: Strawberry mousse, black velvet "soil", vanilla ice cream, chocolate "rocks", streusel, spring greens. For desserts, we could pick any dessert from the dessert menu. Unfortunately, the dessert menu hasn't changed much, and I'd had most of the desserts multiple times. There were only two new ones. The first was the "ichigo patch". It looked totally crazy, like ... a strawberry patch. Not visible is the main component of the dish, the strawberry white chocolate mousse. It was creamy and went very well with the cake components. It was my favorite part of the dish. On top of the mousse was a thin layer of strawberry gelee, which had a good strawberry flavor, but was really easily lost in the other parts of the dish. 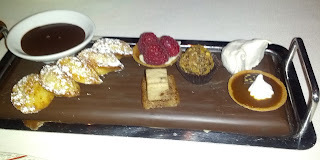 In fact, when I mentioned it, the others who also choose this dessert didn't even realize it was there, and I'd only noticed it because I was deconstructing some bites to analyze them. The final appearance of strawberry was in the whole, fresh strawberries perched on top of the soil. They were good, and definitely added to the presentation of the dish. The black velvet "soil" made up the majority of the dish. This was a chocolate cake, ripped up into pieces. It was fairly standard, not moist, and really just generic chocolate cake. Also scattered amongst the soil were chocolate "rocks". These were hard chunks of something very chocolatey. I liked the chocolate flavor and thought they paired well with the mousse, but it was strange alternately discovering the "rocks" vs "soil", one being so hard and one being so soft, but looking very similar. There was also a little scoop of vanilla ice cream, fairly generic. The spring greens were savory and were a really nice presentation. 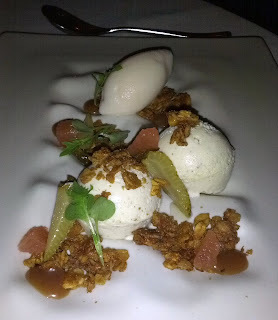 I really wanted to like this dessert, as the components all sounded so good. But there was something just not balanced about it. There was far, far too much of the cake component, it really just over took everything. There wasn't nearly enough ice cream. It also could have used more fresh strawberries. One other person thought it really needed some warm chocolate sauce. I liked the creativity in the presentation, the flavor combinations of chocolate, strawberry, and vanilla, the texture pairings of creamy mousse, spongy cake, crunchy bits, and the fact that this was much more than just cake and ice cream, but ... the cake and ice cream, in particular, were very generic and just not that good. I wouldn't get this again. Grapefruition: black pepper cheesecake, oat crumble, pickled strawberries, grapefruit, caramel. The other new dessert. And another crazy plating - the plate itself was the most interesting serving vessel we saw that night, with all sorts of indents in it. The two big balls in front were the black pepper cheesecake. It had a nice cream cheese flavor, but certainly wasn't a standard cheesecake. The black pepper wasn't noticeable at all at first, but then came through on the finish, spicing things up. 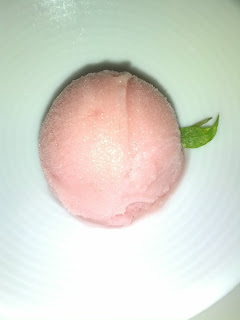 The back ball was a very sweet grapefruit sorbet. I would have liked this more if it were tart. Grapefruit also showed up as whole segments, alongside more vinegary pickled green strawberries. More sweetness was added by the caramel, and some crunch by the oat crumble. This was a fun deconstruction of a cheesecake. I didn't love it, but it had a lot of good things going on - cream cheese, oats, and caramel in particular! Ah, Monday nights. So many of my favorite places are closed. The rest are often working without their executive chefs, and without fresh products. Such a bad night for dining out. But ... I had a friend who I hadn't seen in over a year who wanted to have dinner, so I tried to find a suitable place. Italian seemed like a good pick, particularly somewhere known for pasta, since that doesn't require fresh ingredients nearly as much. We headed to Perbacco, a mid-range italian place, which I hadn't yet been to, although I've seen the chef at a cooking demo recently, and have read decent things about. I was surprised by how large the restaurant was, with a bunch of different seating options. Two stories, open and airy, with some booths, round tables, and several private rooms. The crowd was mostly older, nicely dressed. Service was good. Water glasses refilled, share plates and utensils replenished between courses, good level of detail provided when we asked about dishes, wine recommendations given and a small taste provided before committing. The only issue we had was at the end it was a little hard to find someone to ask where our leftovers had gone to. The menu included many starters, pastas that could be sized as appetizers or entrées, main dishes, and of course, desserts. I'd read the best things about the pastas and desserts, so we decided to stick with those, particularly as the noteworthy appetizers and mains were seafood based, and ... it was Monday. I basically wanted to try all of the pastas, so I appreciated the two size options, as it meant we could order just a bunch of the smaller ones, rather than a single entree sized one. The pastas arrived crazy fast. They were clearly all made with fresh, handmade pasta, but across the board I felt that they were overcooked. None could have been described as al dente. Perhaps that was the intended style? The sauces also weren't particularly great. And they arrived rather lukewarm. They weren't bad exactly, certainly edible, but were disappointing, and I wouldn't order any of them again. The dessert however was delicious. Value was good, the serving sizes generous for very moderate prices. Immediately upon sitting, we were presented with some breadsticks and salsa verde. Neither the breadsticks nor the sauce looked that great, and I mostly tried them just to be able to make a note of it here. But ... they were surprisingly tasty! 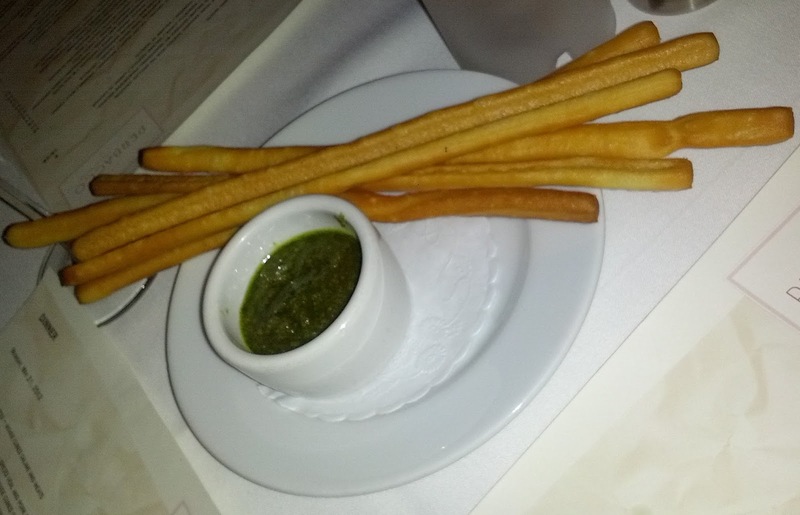 The breadsticks were super thin, crisp, crunchy, buttery, with a slight saltiness. I really didn't expect to like these, but I'd happily nibble on them as a snack anytime. Apparently they were created by accident when the chef was playing with a new pasta machine. Everyone loved them, and they have been served since 2007. As of 2011, they were making 2,300 of these bread sticks a day! The breadsticks however were overshadowed by the salsa verde! It was fantastic. Very flavorful, made with parsley, bread crumbs, lemon zest, and olive oil. The breadsticks weren't the best dipping device for it however, as it was a little hard to scoop up much of it. The bread that would come later worked better. I really enjoyed this on several levels: it was nice to be given a munchie before ordering, it was far more unique than standard bread and butter, and it was tasty! 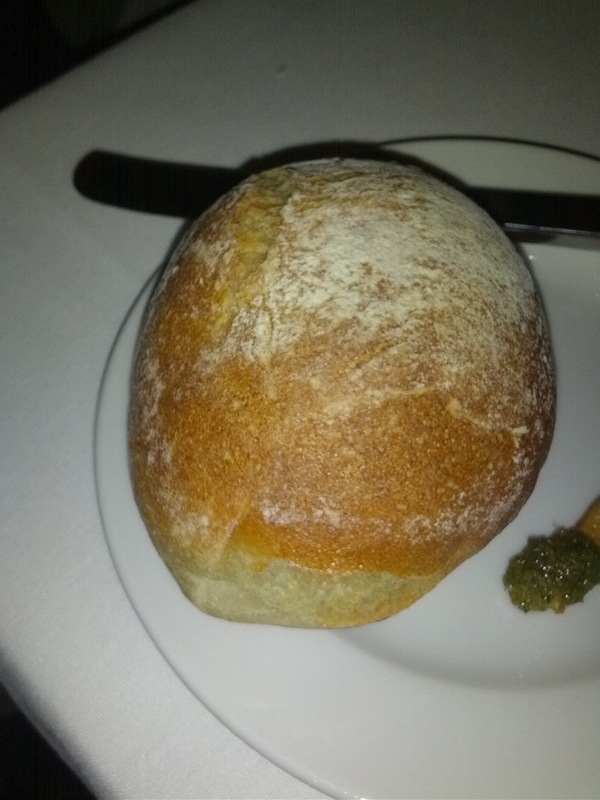 Speaking of standard bread and butter, we did receive that as well, after ordering. This was a huge let down from the breadsticks. The roll was served cold. It had a decent chew, but was very generic. The butter was creamy and actually really good. No salt provided. Pappardelle: wide pasta ribbons / slow cooked short rib ragu / roasted cipolline / grated horseradish. $13 small/$18 large. The pappardelle was a really nice form factor, large pasta ribbons. Clearly fresh pasta, and cooked fairly well, but a little overdone, as it wasn't al dente and didn't have much chew to it. 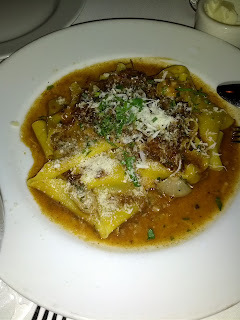 The short rib in the ragu was really tender, flavorful, and there was a generous amount. 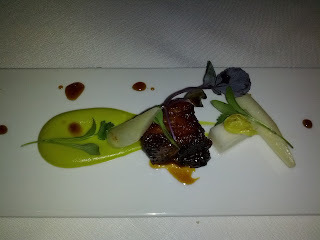 I'm not usually a huge fan of short rib, and liked this much more than I expected. The sauce was pretty rich, and had a real "meaty" flavor to it, but I didn't really like it much. The horseradish didn't come through much in many of the bites I had, but occasionally would come through on the finish, where it was really delicious. The sauce needed more kick overall. I have a thing for cipolline onions, particularly roasted ones, and found them very tasty. There were a few small, whole roasted onions in here. Topped with shaved parmesan, which went well with the ragu. I can't help but compare this to the pappardelle I had a Cotogna recently, which was far better executed, the pasta cooked perfectly, and the ragu more enjoyable. It also reminded me of another dish I had a Cotogna subsequently, with a tomato and horseradish sauce, that again, I enjoyed much more. This was my and one other diner's second favorite dish of the evening, and the least favorite of the other. I wouldn't order it again, as I'd rather try something else. For $13 however, this was a generous serve of fresh pasta. I'm curious how much larger the bigger size was! Agnolotti dal plin filled with roasted vitellone and savoy cabbage / sugo d’arrosto. $13 small/$18 large. This is probably their most famous dish. Everyone raves about it. Been on the menu for ages. It was just recently on list of top San Francisco eats. Unfortunately, it arrived barely warm. I wonder if it would have been better warmer? The pasta was again nice, clearly fresh, but again, slightly overcooked, not having the chew to it I was looking for. The filling was a ground veal (and cabbage?) that was fairly flavorful. 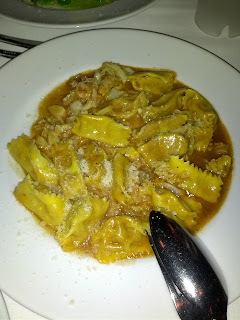 Included in the sauce was some cooked cabbage chunks, which looked a lot like the agnolotti themselves, and I didn't originally realize were there. They added a slight freshness and crunch to the dish. The sauce was really, really boring. It didn't taste like anything at all, just a little salty. Topped with grated parmesan, which didn't really seem to add anything to the dish. This was my and one other diner's second to last pick of the night, but the favorite of one other. I would not order again. I think it was overall better than the version we had at Cotogna, but only slightly, as I didn't like either one. Another very generous serve for $13! 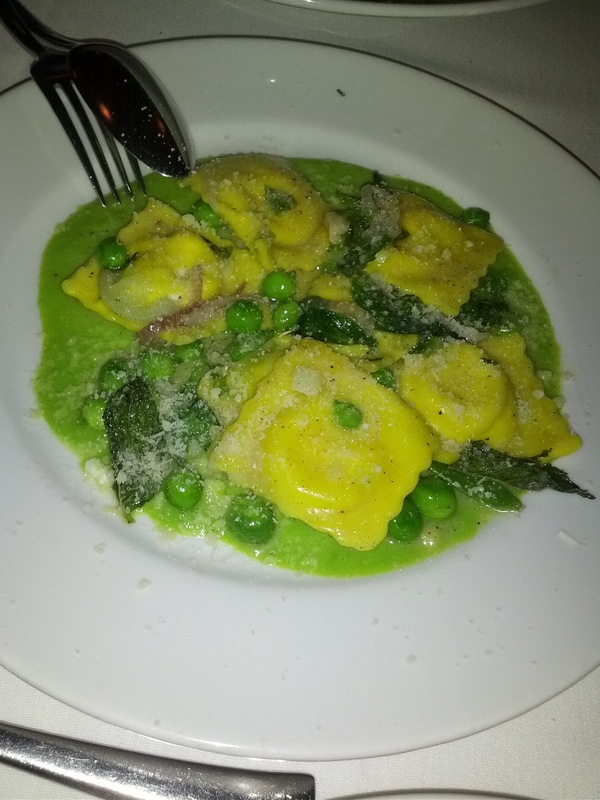 Raviora: pasta filled with ricotta di pecora and mint / spring pea passato / mint butter. $12 small/$17 large. This was the best executed pasta of the night. Again, clearly fresh and this time, it had a slight chew to it. However, I really, really did not like the filling. It had a strange mouthfeel to it, and was kinda bad tasting ricotta. Generic grocery store ricotta tastes better than this. The spring peas came in two forms: full snap peas and some shelled peas. They were really delicious, full of flavor and freshness. 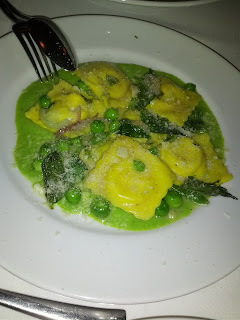 Cooked perfectly, the snap pea was crisp and the shelled peas not mushy at all. There were also whole mint leaves, which were really refreshing and combined nicely with the peas and grated parmesan cheese on top. The sauce looked more flavorful than it was, I didn't really think it had much going on. This was almost a good dish, and I really enjoyed the freshness and flavors of the peas and mint, but the filling was just awful. Least favorite dish for two of us, although second favorite for another. I would not order again. And yet again, this seemed like a really good value for only $12. 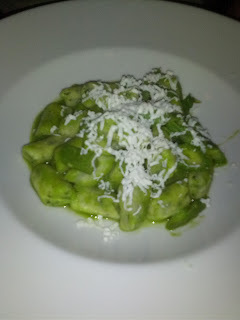 Rabatòn: herb and spinach ricotta gnocchi / local green asparagus / ricotta salata. $12 small/$17 large. Now this was a fresh, seasonal dish! Ordered because we knew that local asparagus season is winding down. The gnocchi were fairly forgettable. They were fluffy, clearly just boiled and not pan finished (how I prefer my gnocchi). I didn't really taste any herbs or spinach in them as advertised, although they were green, so it must have been there. The asparagus came as some cooked chunks of spear and as the sauce. The cooked chunks were nicely done, still a little crunchy. The sauce was also quite good. The consistency was a little too thick, but it was really light tasting, refreshing, and full of delicious asparagus flavor. You certainly had to like asparagus to like this dish. Topped with ricotta salata, which added a good saltiness that paired well with the asparagus. Favorite dish for two of us, but third favorite for the other. I still wouldn't order it again though. Sformatino: caramelized milk chocolate mousse dark chocolate glaze / cocoa-almond streusel / crema inglese. $9. This was a decent chocolate mousse dessert. The base was a thin chocolate cake layer. Earlier that day I'd had a dessert that was a much thicker moist chocolate cake topped with chocolate mousse, and I felt it was more successful than this one, as this cake layer was too thin to really be noticeable. 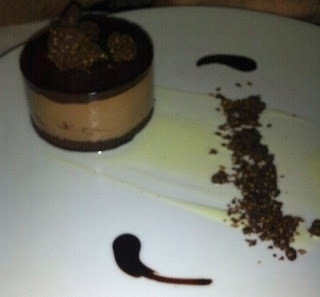 The mousse was a good, creamy, chocolate mousse, but not particularly noteworthy. Again the mousse I'd had earlier in the day had a more intense chocolate flavor that I enjoyed more. The dark chocolate glaze was a really nice touch. It was fairly thick, bitter, and added a lot more chocolate intensity to the dish. The cocoa-almond streusel on top and on the plate wasn't particularly noteworthy, just a basic chocolate crumble. The crema inglese was sweet and good, but there wasn't nearly enough of it. Overall, not a bad dessert, but not particularly memorable. Decent size and quality for $9. I wouldn't order again. Douglas fir panna cotta / pine nut crumble / mugolio. $9. This dessert didn't sound that great, but I do enjoy a good creamy pudding dessert, like a panna cotta. I'd also read great reviews of this, but then again, I've kinda learned not to trust the Yelpers. 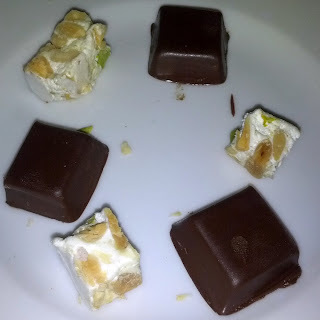 But most of the other desserts on the menu were all chocolate, and I was trying to limit my caffeine intake, and the other diners weren't interested in the other dessert that sounded good to me (a semifreddo with meringue, my other dessert obsession!). So, we tried this one. It was awesome. 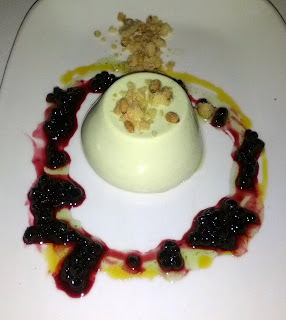 The panna cotta had a fantastic wiggle to it! The consistency was perfect, very creamy. The flavor was really hard to describe, certainly not what I'd think douglas fir would taste like. I never once thought I was eating a christmas tree :) It was more citrusy, but subtle, and fairly sweet. Really delicious. The pine nut crumble on top was made up primarily of pine nuts. It tasted strongly of pine nut. I don't really like pine nuts, so I didn't like this component at all, but I did understand how the flavor would work well against the other sweet components. The huckleberry sauce was too much, there were tons of huckleberries, and the flavor of this was intense and easily overwhelmed the dish. We left some of it behind. It was good, and paired decently well with the pine nut and the panna cotta, but there was just way too much on the plate. The other syrup on the plate was made form mugolio, a pine cone syrup. I didn't really pick up on this much at all. This was certainly my favorite dessert and the highlight of the meal for me. I'd order it again, but I'd really like to have it without the pine nut. Perfect execution on the panna cotta. Mignardises: hazelnut chocolate, almond honey torrone. These arrived with the bill, on a plate that was clearly fresh out of the dishwasher. By which I mean, it was hot. Which ... caused the chocolates to melt onto it. When I picked up a chocolate, 30% of it was left behind on the plate, and another 10% of it melted all over my fingers. Whoops. This was just a generic creamy hazelnut chocolate. Not noteworthy. The almond honey torrone was a piece of sweet nougat with almond slivers. It would have paired well with tea, but like the chocolate, wasn't really memorable. Tonight we had a big change of pace. No Michelin stars. No fine dining. Just casual indian food. Gajalee opened not that long ago, to pretty fantastic reviews. Food critics and Yelpers alike have been raving about it, particularly mentioning how authentic it is. 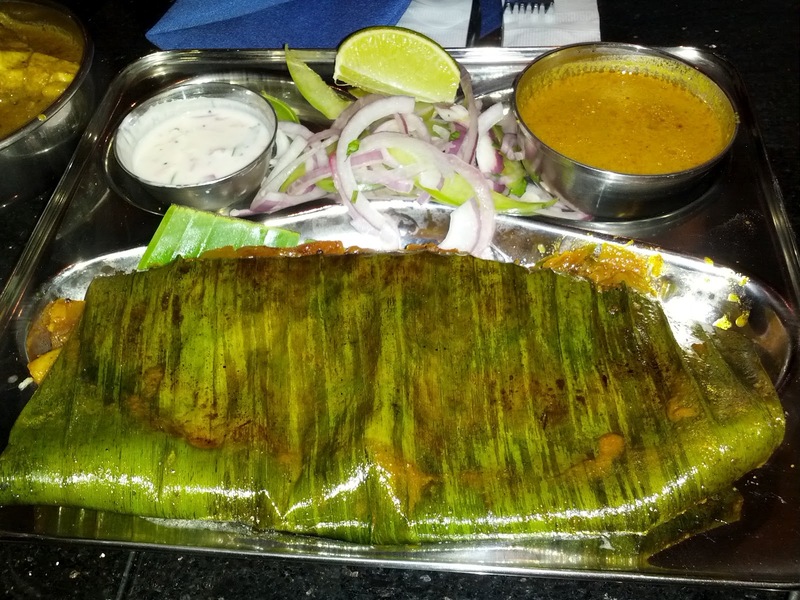 Gajalee serves south indian coastal cuisine, from the Goa, Kerala, and Kamataka regions. While I am not really familiar with south indian food, I was hopeful about this place, particularly as they are largely seafood focused, which sounded great to me, and as I still have yet to find an indian restaurant in San Francisco that I really like. This continues to make me very sad, as I really do enjoy indian food! Service was generally fine, but clearly a bunch of notches down from what I'm used to these days. The waiter was a little difficult to understand. Dishes were presented without any explanation, so I wasn't ever really sure what the side dishes and accompaniments were. We were eating everything family style, but no serving utensils were provided. When we asked to have the leftovers to go, all of our dishes and utensils were cleared away, and some plastic containers were handed to us. We had no way to scoop the food into the containers and needed to ask for new spoons to do so. There was nothing particularly notable about the decor of the restaurant, it was pretty generic and simple. Hard wooden tables and chairs. We were provided with both cloth napkins and paper napkins - the utensils were on the paper napkins and the cloth napkins were inside the water glasses. I think the paper ones may have been intended just as a place to put the silverware? I actually appreciated this, but it made me question the cleanliness of the tables! It was really refreshing to just go to a "normal" restaurant, far more relaxed than the style of dining we have been doing so much of lately. The prices were shockingly low for the seeming quality and quantity of food. Definitely a good value, particularly compared to the far more upscale SOMA Amber and Pac Heights Dosa type of options, although the product was clearly lower quality than those places. I didn't particularly like anything we ordered, but I think this could have been due to not ordering the sort of dishes I normally like. There was some good spicing, which makes me hopeful that dishes more my style would be good. Since I wasn't that familiar with south indian food, I stuck with recommendations from reviews, rather than what I'd graviate towards. I'd like to return to try the chicken tikka masala, the palak paneer, and the fried fish. 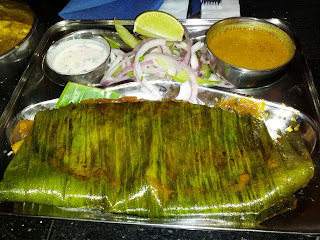 Meen pollichathu: ﬁsh marinated in home made spices and slow cooked in plantain leaf. $13. This was a very large filet of sea bass, steamed in a plantain leaf, and covered with chopped onion and tomato based sauced. The fish was moist and tender, and seemed decent quality. The sauce was really flavorful, fresh tasting, and delicious. It reminded me more of an italian dish than an indian one given the strong tomato and onion component. It was served with a side of raita and a curry sauce, neither of which were really necessary as the tomato and onion sauce on the fish itself was so flavorful. It also had a small side salad of raw red onions and peppers, which were surprisingly fresh and crispy, that I enjoyed, and also added to the very fresh feeling of the dish. This dish was by far the best of the evening. The whole thing felt light, healthy, and refreshing. The tomato and onion sauce was really flavorful. I wouldn't go out of my way for it, but I'd eat it again. And $13 for a filet this size? Very high value. Fish xaccuti: tamarind and caramalized onion based sauce. $13. 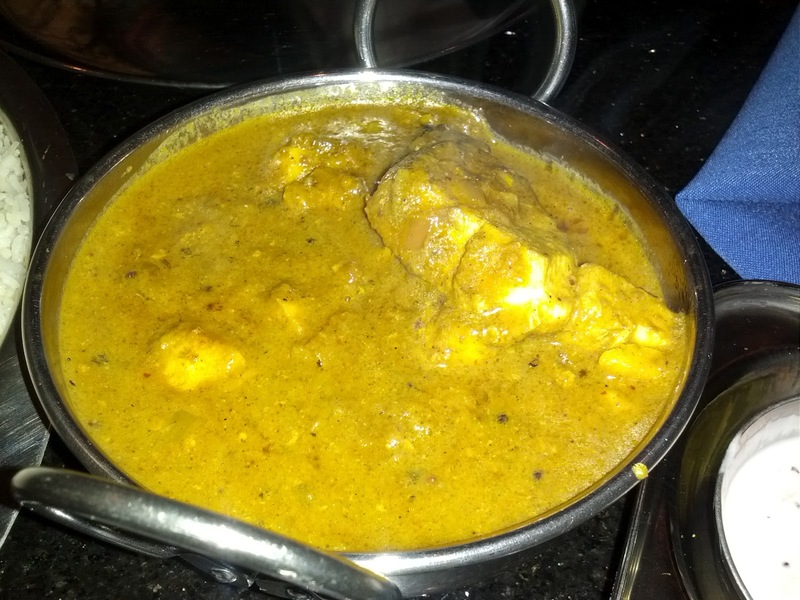 This is a dish I wasn't familiar with, from the Goan region. I would have never ordered this normally, but I had read good things about it. The fish used was basa, and it was really just a generic, flaky white fish. Every chunk I had unfortunately had very small pieces of bones in it. We had one diner with a sensitive stomach, so we ordered everything medium spicy. This dish still had a nice spice level to it. I didn't particularly like the spices or sauce, I think it just wasn't my sort of thing. I didn't taste any caramelized onion. This made me sad, as my favorite part of indian cuisine is the delicious sauces! I didn't really care for this - the fish itself wasn't very good, I certainly wasn't a fan of the bone fragments, and the sauce just wasn't my sort of thing. I would not get this again. I've read that it is a really authentic dish however, so this could just be personal preference. Paratha: multi layered white ﬂour, pan fried. $2 each (2 orders pictured). Another recommended dish. I almost really liked this. I am more familiar with naan as my bread accompaniment to indian food, so this was nice to try as something different (they have a large selection of breads, but no naan). 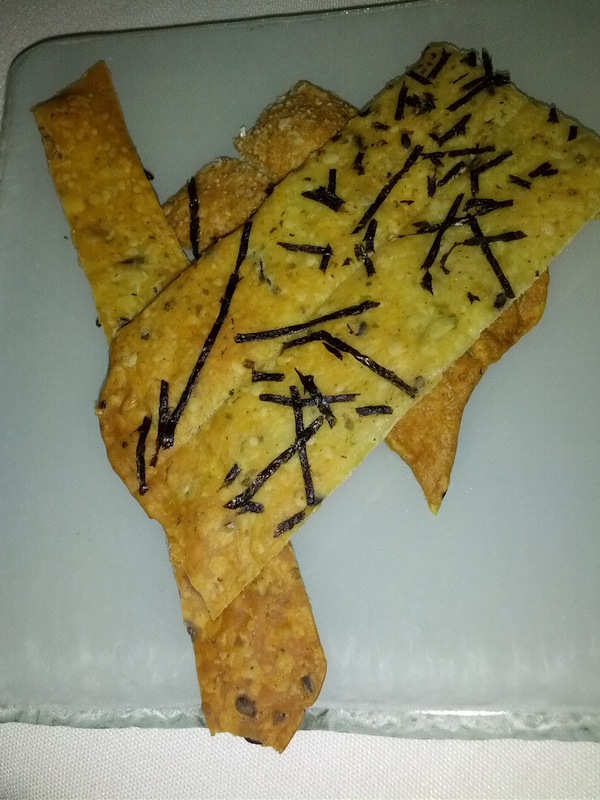 It was made up of many layers, making it fun to eat, peeling off pieces. The inside was moist, the outside crispy and fried. It had a hearty flavor to it, and I was surprised to see that it was made from white flour, as it seemed more flavorful than that. It was however just too oily for my taste. Had it been just a little less oily, I think I would have really liked it, as it reminded me of fried dough. We had two of these for four people, which was too much, a single one would have been fine as they were really quite large. $2 was a very reasonable price. 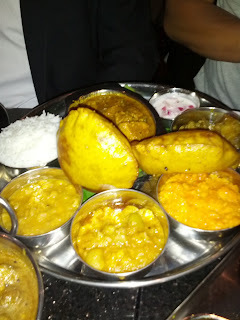 Fish Thali: selection of different dishes served in a round platter. $15. The most recommended dish I'd read about was the fish thali. I love getting to try a slew of things, so this appealed to me in that sense too, described as "selection of different dishes served in a round platter: kochambiri, two vegs of the day, basmati rice, dessert and two pcs of komdi vade, served with your choice of main course". So many things to try! However, the main dish that everyone raved about when referring to the thali was a fried fish, and ours came with a curry. Komdivade: rice ﬂour, gram ﬂour, fenugreek seed, cumin, red chill. This was the puffy bread in the center of the platter. It was really hearty, with good flavor. I didn't love it, but it was nice to have to dunk into all the sides. Raita: This was different from the raita that came with the plantain leaf steamed fish in that it was loaded up with bits of raw red onion. Not particularly interesting, but a nice cooling component. Eggplant veggie side: I'm not sure entirely what this was, but it had chunks of eggplant and potatoes. The potato was rather mushy and everything seemed overcooked. Not really notable, but had ok spicing. Carrot halwa: grated carrot with cheese and milk. This was delicious! 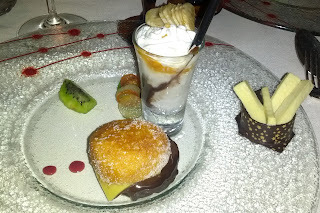 I didn't realize originally that this was the dessert, as it was included on the platter with the rest of the thali. I had a bite of it mixed with some of the other sides, and thought it was really sweet and amazing, but perhaps a little too sweet and strange to mix with the fish in particular. Then I remembered that the menu said the thali would include a dessert, and that the menu listed 3 desserts: rice pudding, carrot halwa, or gulab jamun. Given that I certainly didn't see rice pudding nor dumplings, and this was definitely carrot based, I put two and two together. I'd never had carrot halwa before, and I must say, I really liked it. I was put off by the very mushy consistency at first, but it was a really nice level of natural sweetness from the carrot, balanced by some other spices, and enhanced by added sugars. I didn't pick up on the cheese. My favorite dish of the night, hands down. Cauliflower veggie side: another side that I am not really sure what it was. The primary ingredient was cauliflower, but there were also some beans. Again, very similar to the eggplant side in that the vegetables were rather mushy and seemed overcooked. The flavors were ok, but nothing great. Lentil veggie side: and yet another vegetable side dish. Was this the kochambiri? I thought kochambiri was supposed to be a raw, more salad like dish, but this is the closest thing to it. More just mushy vegetables. Basmati rice: fluffy enough rice, nothing much to say here. We also had a regular order of this as well. Fish curry: This wasn't much different from the other curry we had. It was also basa. The fish was in slightly smaller chunks and was less moist. The sauce seemed very smilier to the xaccuti. We all wondered if it was the same, but it seemed slightly different. I wish the waiter would have mentioned that we were ordering two of essentially the same thing. We really wanted, and expected, this to be the fried fish! The only thing I really liked on this platter was the dessert. I would not order this again. In the future, I'd stick to ordering things a la carte - I'd get the fried fish, the veggie sides I was more interested in, and of course, the dessert. That said, I did appreciate getting to try a bunch of things, and I would have never ordered the carrot halwa on my own. This was a ton of food for $15, a great value. Sol kadi: kokum and coconut based drink. $3. I'd read that this drink would go well with the food. It was crazy salty. I didn't particularly like it, but it would have definitely helped to mellow out the heat had we ordered the food spicy. For a team bonding event at work, I organized a group dinner at Fleur de Lys, Hubert Keller's flagship Michelin starred restaurant in San Francisco. 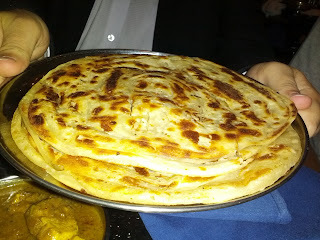 I had never been before, but one of my dining companions has often told me that it is his favorite restaurant in the city, and when I found that they could fall within our budget, I was immediately sold. 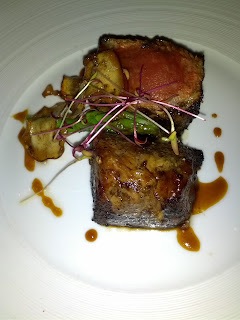 The menu consisted of 3 courses, for $80 (normally $72 if not doing a group event). They also offer 4 or 5 course options, for $82 and $95, respectively. Given the two amuse bouches and generous mignardises, this is a fairly good price. With any group event, you certainly don't get the same experience as dining in the restaurant as a smaller party, but Fleur de Lys did a good job at the group experience. The staff were really easy to work with to arrange the event. We had 24 people, and a single main server. She was pretty busy throughout the evening, but was attentive enough. There were additional servers who helped bring out the food, kept our water glasses filled, and brought out the bread. The dishes were presented with very minimal explanation, which, given the number of components on the plates, was a little annoying. I wanted to know more details, and when I asked for them, was still only given partial explanations. The staff also didn't seem interested in telling me these things. I think they were just very busy and flustered. I had to set a fixed menu in advance, with only two appetizer choices, a few entree choices, and no dessert choices. However, I was able to have considerable input into the menu options, and although my very top choices weren't available for the group, my second tier of choices all were. They also offerred a vegetarian menu, and were able to handle assorted allergies, substituting out dishes as necessary. 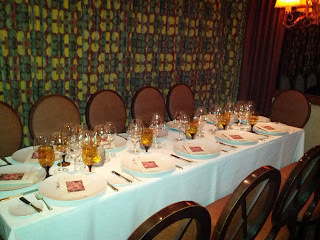 We worked with the sommelier in advance to come up with wine pairings, which were fabulous. They have some very nice wines to offer! I also really appreciated their respect of our budget. We needed to spend about half of what they normally charge for a regular wine pairing, and thus we opted to just purchase some bottles to go with each course. As we approached our limit, they let me know, and asked for guidance on how to proceed. They also saw that we were consuming a lot of wine at the start while we were waiting for our first dishes, and stopped refilling glasses quite as quickly to pace us, so we didn't hit our budget before the mains arrived. The meal started off very slowly. I was actually surprised at how long it took for any food to arrive, not even bread or an amuse bouche. Once it started arriving, pacing was good, fairly fast actually, and things moved right along. I'm not really sure why it took so long to get started, perhaps they are used to groups ordering cocktails and not wanting to start eating right away? Overall, the food was all very good, but not particularly memorable other than the downright adorable plating and whimsy to the dishes. I probably wouldn't order any of these dishes again, but, they also weren't my first choices to begin with. That said, the execution level was very impressive for group dining, with the food arriving fairly simultaneously, and all the correct temperatures. Certainly one of the better large group dining experiences that I've had. If they can do a group this well, I'm pretty confident that their regular service must be great, and I plan to return before July 1, so I can try out the foie gras dishes that they are known for! Amuse Bouche #1: quinoa salad and cappuccino. 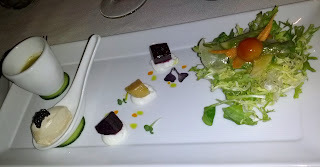 The first amuse bouche was described as a "cappuccino", paired with a bite sized salad, both cold dishes. The cappuccino was made from a piquillo pepper gazpacho, topped with parsley mousse. It was served with a straw. I did not enjoy my first few sips of it through the straw, as only the gazpacho came through. 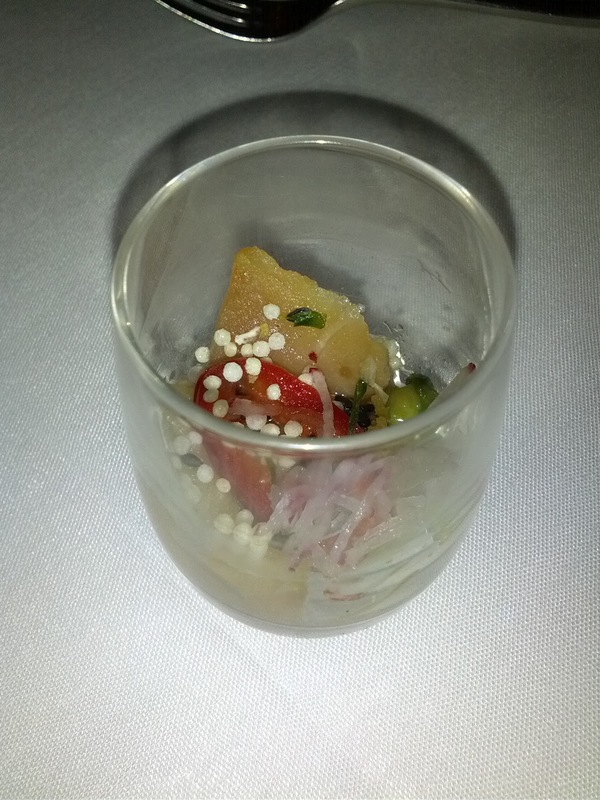 The gazpacho, although light and refreshing, had a very strong pepper flavor, that was just too much on its own. However, the mousse complimented it very well, and mixing some into the gazpacho mellowed out the flavor quite a bit. The mousse itself was really creamy and delicious. I really enjoyed the experience of consuming this, alternating between drinking through the straw and using the straw to just scoop some of the mousse into my mouth, like I would with a milkshake topped with whipped cream. In fact, this was much more milkshake like than cappuccino, I'm not really sure why they called it a cappuccino, as the mousse was far to thick to simulate frothed milk, and more closely resembled whipped cream. The quinoa salad was topped with smoked chorizo and a dot of aji amarillo. It had a decent earthyness to it, but it really was just a generic bite of quinoa salad that could come from just about anywhere. The most boring dish we'd see all night, by far. Both components were plated in vessels perched upon cucumber slices. I don't think we were intended to eat them, but it seemed strange to have edible garnish that we wouldn't eat. Sort of the opposite of the more common problem of having inedible garnish. This amuse was a good foreshadower of the meal to come: it would be filled with multi-component dishes, cute plating, and some whimsy. Baguette, fruit and nut bread. The bread service was a little strange. Rather than being asked what we wanted, 4 slices of bread were just put on our plates, 2 each of baguette and a bread filled with fruit and nuts. I would have asked for only one slice and skipped the baguette. This seemed pretty wasteful. The baguette was just a generic, standard baguette. The non-baguette bread was hearty, soft, with a nice chew to it. Mine had some full chunks of nut, I think macadamia, and some dried fruit, I think apricot. 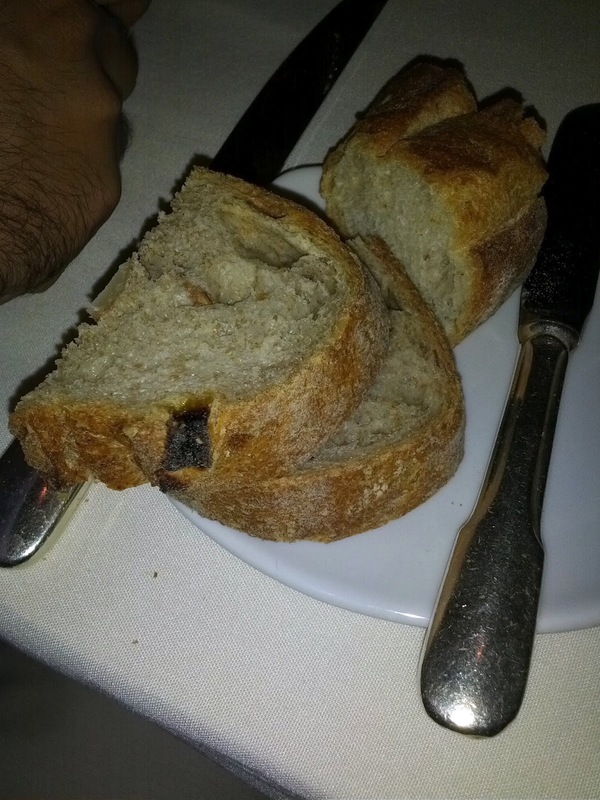 This bread varied substantially from person to person however. I'm not sure if they were actually serving different bread, or if the ingredients were just not well distributed, as some of us had a lot of fruit and nuts, and others didn't. It also seemed like there were different fruits and nuts in different slices. Anyway, I liked this bread, but it wasn't spectacular. Butter, salt on the side. 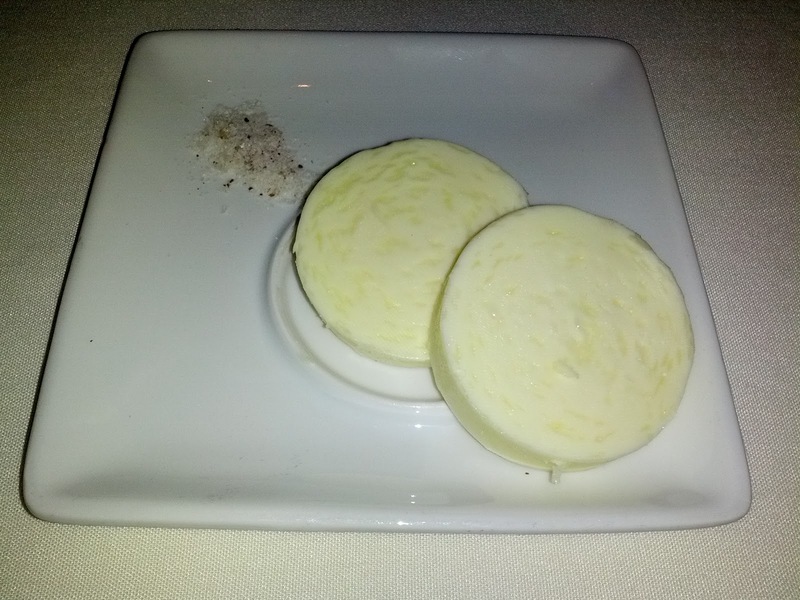 The butter plates were placed on the table in front of us, and I inquired about what type of butter it was. The server looked at me like I had 10 heads and didn't say anything. I asked again, "Is this cow's milk butter? Are they both the same?" And he again just stared at me, finally saying, "It is butter. For the bread". Was it that strange to ask about this? Often when there are two butters provided, they are different! 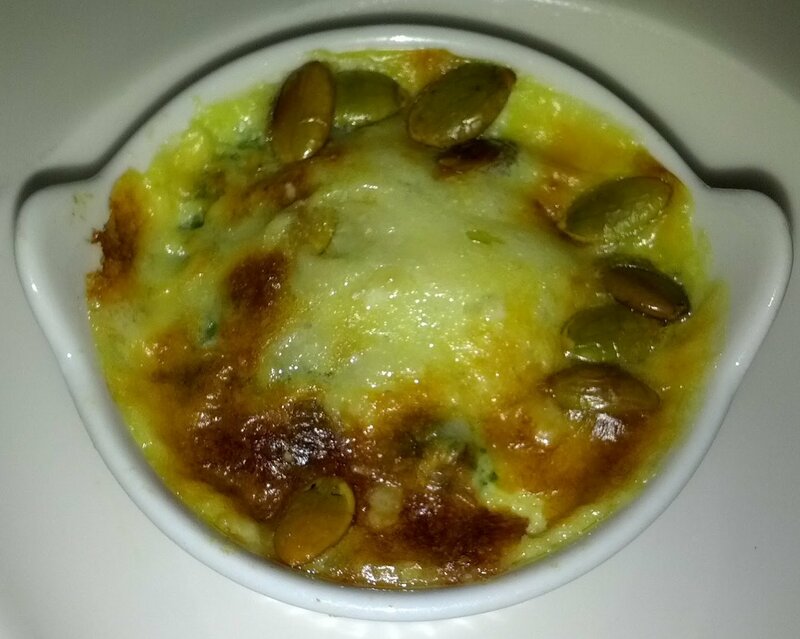 Amuse Bouche #2: Spinach and parmesan gratin. A second amuse bouche arrived, a warm gratin. The cheesy spinach layer was topped with an additional cheesy layer and toasted pumpkin seeds. The spinach was really mushy and somewhat off putting, almost a puree, although I don't think it was supposed to be. It seemed very overcooked. The cheese layer was creamy and was just too much additional cheese. I didn't like this at all. The tiny little gratin dish was adorable. I really enjoyed all of the miniature serving dishes they used throughout the meal! 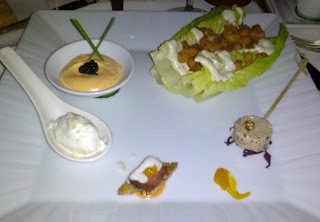 SYMPHONY OF: Petite caesar salad, foie gras lollipop, smoked duck crostini, parmesan mousse, and tuna fondant with caviar. I LOVED the sound of this appetizer. So many amazing components, on one plate! The caesar salad was nothing notable. The romain lettuce was crisp and fresh enough, but it was just lettuce. The dressing was fairly standard caesar dressing, somewhat lacking in anchovy flavor. It was topped with fried spaetzle, again showing the chef's creative and playful side. They were crunchy, tasty little bits, and far more interesting than standard croutons. But overall, just a standard caesar salad. The foie gras lollipop was the element of the meal I was most looking forward to, given my love of foie. It was indeed the highlight of the appetizers. Creamy, with a good foie flavor. Topped with a tiny bit of grainy mustard and served on top of red cabbage. I didn't understand the cabbage at all. I'm not sure what the smear of orange sauce was, apricot perhaps? The smoked duck crostini was a small slice of bread, topped with the smoked duck, topped with mozzarella, and apricot. The duck had a really good smoked flavor, but was very chewy, and just really not my thing. The next component was one not mentioned in the menu description, a parmesan mousse. It was very creamy, very intensely parmesan flavored. It was really strange to eat on its own, kinda just too much parmesan. I realize in retrospect that perhaps it should have been combined with the caesar salad, as caesar salad normally has parmesan, and was lacking that entirely, and this item wasn't listed on the menu. Hmmm. I wish I'd thought of combining this at the time! Or perhaps spreading it on some bread? I didn't enjoy it much as it was, but I think there was potential here. The tuna fondant was really fluffy and had a nice tuna flavor. The caviar on top added a good saltiness and of couse some texture. My second favorite dish on the plate. I wonder how it would have also combined with the caesar, perhaps bringing in a fishy flavor that seemed missing. Overall, this was cute, playful, full of different textures, and I enjoyed getting to have so many assorted bites, but besides the foie gras, nothing here was that fantastic. I think I may have just missed the potential in combining things in winning ways however. Both appetizer choices were paired with a really lovely Riesling. It was sweet, but nicely balanced. I really, really liked this wine. CHILLED DUNGENESS CRAB SALAD: With shavings of young vegetables, lobster infused vinaigrette, and lobster fondant with caviar. This was my neighbor's dish, and he graciously let me try some of it. Yes, this was a crab salad. What, you can't see the crab? It was hiding under the bed of frisee and assorted shaved vegetables. It came with a little dressing on it, but a cup of additional vinaigrette was provided to allow the diner to add as much as he or she wanted. It was a very light and refreshing salad. The frisee almost seemed too bitter to pair with the delicate, sweet crab however, as it was all you tasted. There were also some slices of beet, perched atop goat cheese. 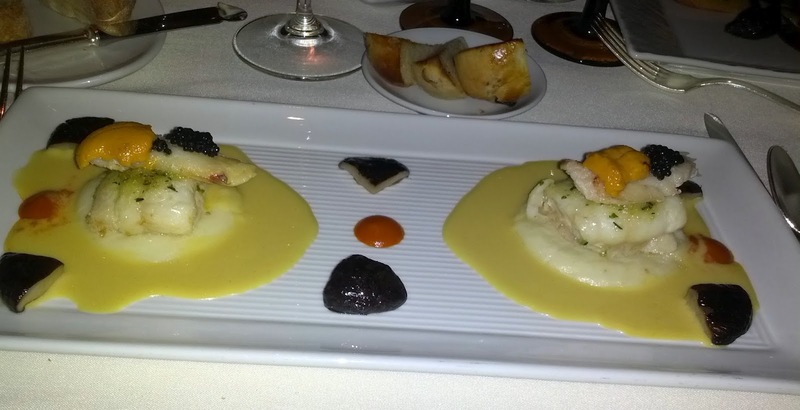 The lobster fondant was similar to the tuna fondant in my dish. It was a surprisingly light mousse, with a really strong lobster flavor. It was also topped with caviar, which again provided a fun pop and saltiness. Another well designed dish, but it wasn't as interesting as it sounded. I preferred my appetizer. 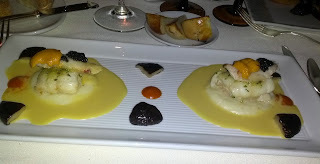 LOCAL PETRALE SOLE: Dungeness crab, sea urchin and caviar, olive oil potato purée, toasted bacon brioche. This was my main dish. This is normally an appetizer on the menu, but I really wanted this as an option, and for group dining they couldn't have it as an appetizer, but offered to scale it up and do it as an entree instead. I'm guessing that it normally just has half of this plate. But a chance to have even more crab and urchin? Sounds good to me! There was a lot going on here. The bottom layer was the olive oil potato puree, then the sole, then a chunk of crab, then a chunk of sea urchin, then some caviar. It was surrounded by a lobster and uni bisque that was poured on tableside. Also on the plate were some chunks of mushroom and a pepper sauce. And it came with a bacon brioche. Wowzer. And I thought the "Symphony" was made up of power house ingredients, how often do you get a few of my favorite things, crab, urchin, caviar, lobster, and a nice fish, all in one dish? The sole was nicely cooked, flaky, moist, with a good texture. It had a decent flavor. Nothing particularly exciting, but a well done piece of white fish. The crab on top was fine, but not particularly memorable. It was cold, which I think was by design. The urchin was creamy, with a good briny flavor. It wasn't quite on par with some uni I've had lately at sushi restaurants, but it was good enough. The caviar was more of the same caviar we'd had in the appetizers, again, providing saltiness and pop. This tower of components was all good, but it didn't really sum up to be greater than its parts, which I had hoped for. It was also a little hard to cut everything up into small enough pieces that you could get a bite that contained all of the elements - sole, crab, urchin, and caviar. The mushrooms seemed totally and completely unnecessary. They were just chunks of mushroom and didn't pair particularly well with anything. The dots of pepper sauce were good. It was spicy, and I enjoyed dipping the crab into it. The lobster and urchin bisque was creamy and pretty delicious. It made for an awesome sauce on the potato puree. Speaking of that potato puree - it was the highlight of the dish for me. Yup, a dish made out of insane ingredients that I love, and the POTOTO is the thing I rave about? It was just awesome. Smooth, creamy, delicious. So flavorful from the olive oil. My tasting notes just say AWESOME in all caps here :) I could have eaten a whole bowl of this, particularly with the bisque on top. YUM. I'm not entirely sure why this came with bacon brioche. The bread wasn't particularly noteworthy, just some brioche with a subtle bacon flavor. I'm glad it existed however, because it allowed me to soak up every last drop of the potato puree and the bisque. HAWAIIAN SWORDFISH, SEED CRUST, POTATO MARBLES & SPECK: Basquaise & pinot sauce with a side of saffron soup. This was my neighbor's dish. Again, he nicely let me try some of it. The swordfish was a fairly thin, small piece. This dish was substantially smaller than any of the other entrees, I'm not sure why. The portion of fish alone was smaller than the sole dish, which then had the crab, uni, and bread to go with it, and the other choices included large portions of buffalo, filet mignon, or a trio of lamb. The swordfish, like the sole, was good, quality fish, cooked well, but not particularly memorable. Topped with a nice enough caper and pepper sauce. The potato was very thinly sliced, cooked well so that it wasn't too mushy nor to crisp, but at the end of the day, just potato slices. Nothing compared to my puree! We couldn't find any speck in the dish. Perhaps it was forgotten? It seems like it would have paired well with the swordfish. The sauce however, was amazing. Oh, the french and their sauces. I couldn't get enough of it. Once I ran out of potato puree on my plate to lap up, I moved on to soaking up all of this remaining sauce with my bacon brioche. And then when the brioche ran out, and there was still some sauce, with my baguette that I never thought I'd bother eating. Had I discovered this sauce earlier in the meal, I would have tried to combine it with my potato puree. Now THAT would have been amazing. I did not try the saffron soup, but it was described as being very intensely saffron flavored. I preferred my dish, but this sauce was pretty spectacular. This was paired with a pinot, that was pretty complex, with very subtle tanin. COFFEE RUBBED BUFFALO STEAK, WITH PICKLED FIGS: Caramelized leeks, espresso and fig red wine sauce, cornbread madeleine. I didn't get a photo of it, but I also enjoyed some of my other neighbor's dish, the buffalo. It was tender, nicely cooked, lean buffalo, served already in slices. The coffee rub and espresso and fig red wine sauce had a really fantastic coffee flavor, mellow yet pronounced at the same time, really quite refined. Another phenomenal sauce. FLEURBURGER: Lightly spiced dark chocolate ganache, home-made beignet, banana flavored milk shake & frozen fennel ice cream “Pommes Frites”. This is their signature dessert. I didn't actually have very high expectations for this, even given all the rave reviews, as it seemed pretty gimmicky. I had to admit that it was adorable and pretty amazing looking, but I seriously doubted it would be that good. For the most part, I was wrong. The burger had beignets as buns. The beignet was cold, coated in sugar, and not that great. I was also still coming down from my amazing donut experience at Cyrus a few days prior, and I think pretty much no donut-like element was possibly going to impress me. It would have been much better had it been warm and fresh however. The patty was the chocolate ganache, coated with even more chocolate sauce. The ganache was creamy, intensely chocolatey, and really quite good. It was topped with a slice of "cheese", made from passionfruit gelee. It was fun to pick this up and eat it as a burger, but given that I wasn't loving the beignets, I preferred to just take the ganache out and eat it alone with a fork. Of course, every burger needs some lettuce, tomato, and onion, so we were provided with a mint leaf, and slices of kumquat and apple to top the burger. And of course, a kiwi pickle on the side. These were just standard chunks of fruit, but totally adorable. The plate also had some dots of strawberry "ketchup". The cuteness continued with the fennel ice cream french fries, served in an container made from chocolate. The chocolate was pretty standrad, but I loved the idea of the edible vessel. The fries were intensely fennel flavored, but I didn't particularly like them. These components definitely fell more on the gimmicky rather than good side of the spectrum. I also wasn't sure how I was supposed to eat them. I picked up the first fry, but it wasn't structurally sound enough to withstand being held like that, and subsequent ones were certainly too melted. And then there was the banana shake. It had chocolate and caramel sauce swirled in. Topped with whipped cream. And more banana slices. Oh my gosh this was good. I never expected to have the best shake of my life at a fancy french restaurant! (although, this seems to be a trend - a few days earlier I had the best donut of my life at two Michelin starred Cyrus). I wish you could just order this shake. It kinda makes me want to check out Burger Bar again, as they have a large menu of shakes (and several dessert burgers too). Anyway, this dessert was a surprise delight. The shake was just incredible and the ganache really quite good, although the beignets, fries, and other components were rather mediocre. But seriously, how ridiculously adorable was it? 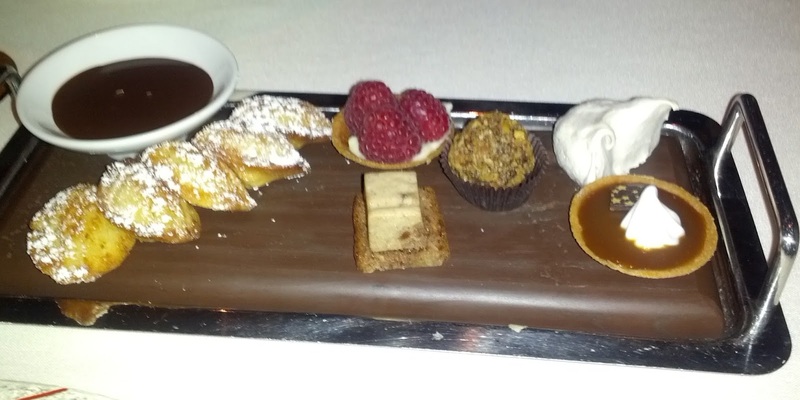 Mignardises: madelines with chocolate dipping sauce, fruit tart, hazelnut chocolate truffle, meringue, caramel tart, gingerbread mousse on banana bread. The madelines were served warm, rolled in powdered sugar. They were moist and fine, but I don't really like madelines much. The chocolate dipping sauce was pretty generic. I didn't have the fruit tart. The truffle was good. Creamy, delicious, smooth chocolate, rolled in hazelnuts. It tasted like Nutella, but with more texture from the chopped nuts. Best of the mignardises. The meringue was a crispy style, filled with chocolate. It was very sweet and nice enough. It would have gone well with some coffee or tea. The caramel tart was a salted caramel. Gooey, creamy, sweet caramel, nice level of saltiness. Pretty tasty, and my second favorite of the mignardises. Finally, there was a gingerbread mousse on a banana bread. The bread was moist, the mousse had a good ginger flavor, but this was pretty forgettable. One of our two tables in the semi-private alcove. The area was at the back of the restaurant, but not separated with hard walls. A full private room would have been nicer, but this felt fairly secluded, and I actually liked being able to see the rest of the restaurant in action. We had the maximum number of people (24, 12 at each table), and it was fairly cramped, particularly on the ends. Our custom menus were printed out and came with a gold Fleur de Lys seal. So fancy!